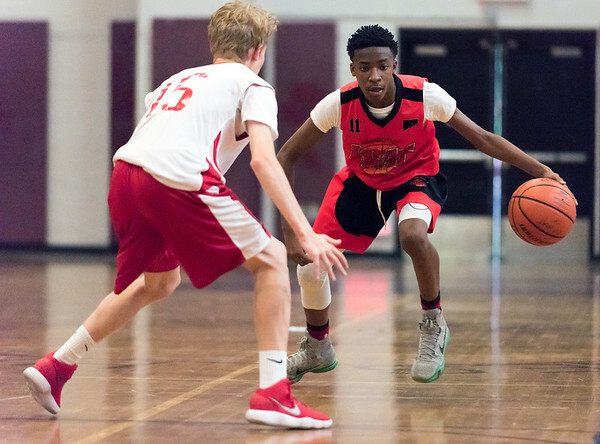 NEW BRITAIN - It was a tale of two halves for the CT Heat (New Britain) in the opening round of the Nutmeg Games 14U boys basketball tournament. After jumping out to an early 24-19 lead in the first half, the Heat were outscored by 13 points in the second half, falling to Vale (Middletown) 47-39 at New Britain High School Wednesday night. Vale took advantage of mistakes the CT Heat made all game long. After focusing on the long-range shooting in the first half, Vale drove to the paint much more in the second half. In doing so, Vale was in the bonus with nearly three minutes left in the game, which led to nine free points in that time span. New Britain also had 13 turnovers in the game. Combine that with what Feehan thought were several missed open shots, the coach said his team left a lot of points on the floor. One highlight on New Britain was point guard Nasir Walker-Jenkins. He had nine points in the game on 4-of-9 shooting, adding three assists and two rebounds. Walker-Jenkins was also solid defensively, grabbing four of the team’s eight steals. Forward Manassah DaLomba had a solid game off the bench for the Heat, notching 10 points and six rebounds. However, all of his points and all but two of his rebounds came in the first half - a sign of the second half struggles up and down the roster. While it is only the first game of the tournament, Feehan knows his team has a lot to work on if it wants a chance to get into either medal game Sunday. Posted in The Bristol Press, General Sports on Wednesday, 1 August 2018 20:53. Updated: Wednesday, 1 August 2018 20:56.